"We have been competing in the juniors together, she’ll always been of the top juniors, and while I was away, she really started to make her mark on the Tour. 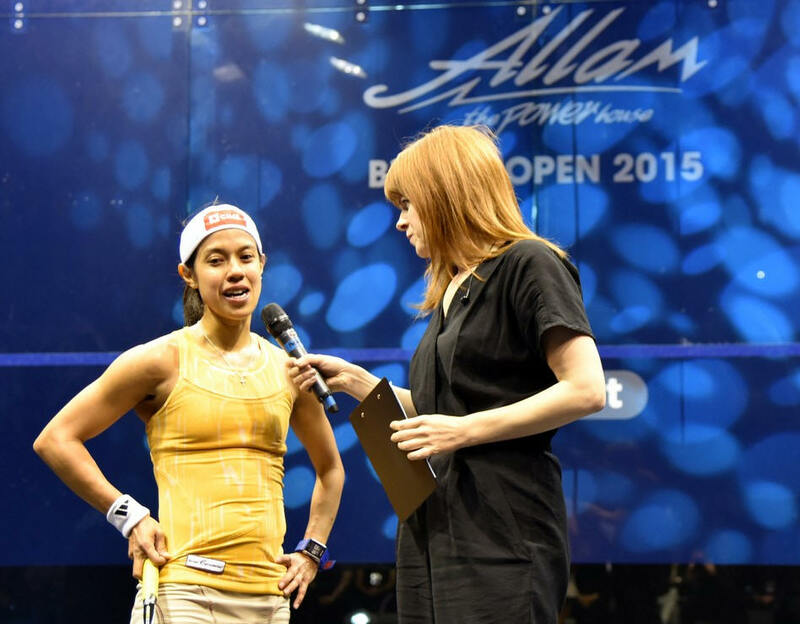 "I really feel emotional today, because it’s been a long road, and I’m really privileged to be able to come back…"
Anyway, back to squash, basically, Joelle dominated the show. Planted on the T, constantly in front of Vicki, her length was just perfect, as she never left the Glass Court. If in the Uni she played a powerful squash, today, it was a tactical one. And that one too, she played to perfection. The English girl was on the other hand never really comfortable on there. 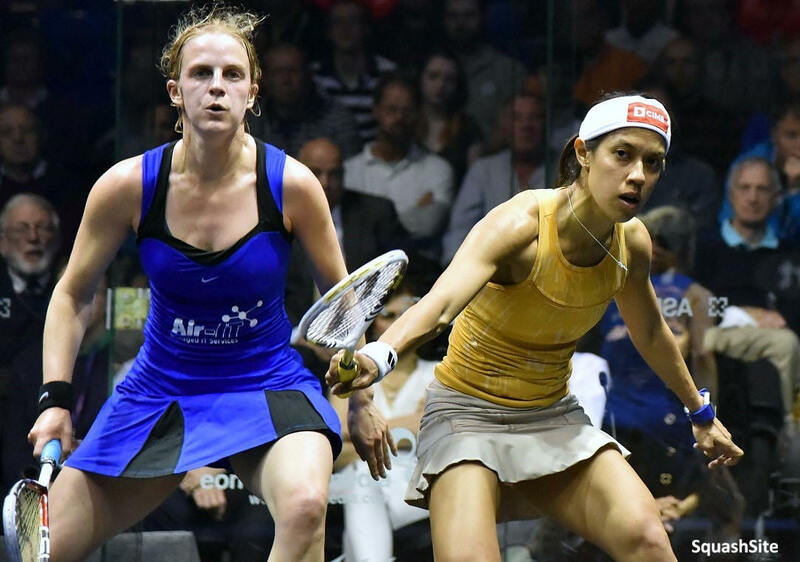 Struggling with her length and basic game, she had trouble putting Joelle under any kind of pressure, and the New Zealander just did more or less what she had decided to do: as in, move her opponent around, a simple and strong and accurate and efficient squash. 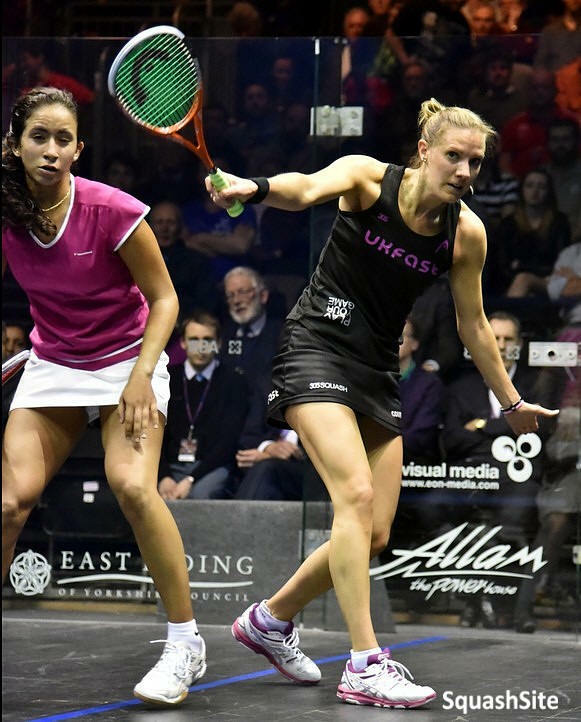 Bless her, Sarah Jane keeps having some great gifts for her birthday, and I think it’s mighty nice of England Squash to systematically organise the Allam BO to coincide with SJP’s day of the year! 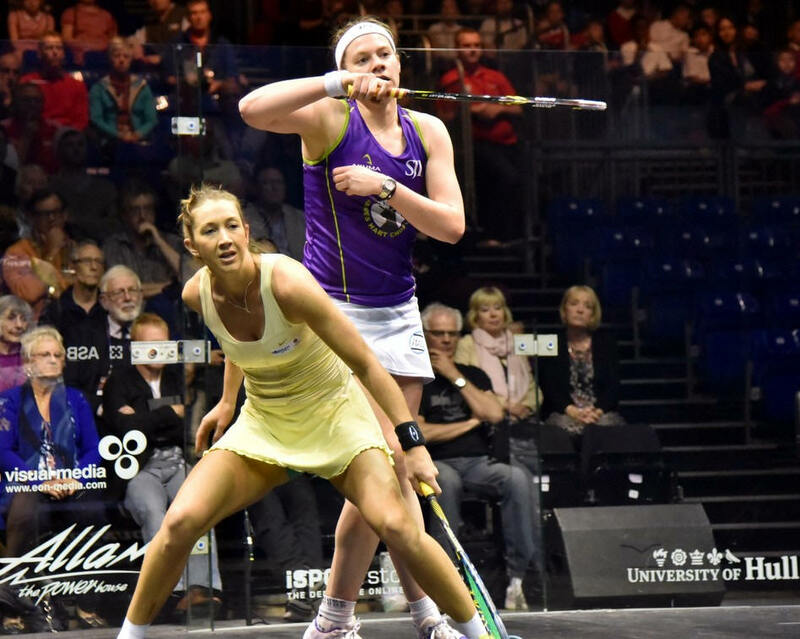 It was not as easy as it may look, as Donna did her best to get a chance to have a go at the World number one. 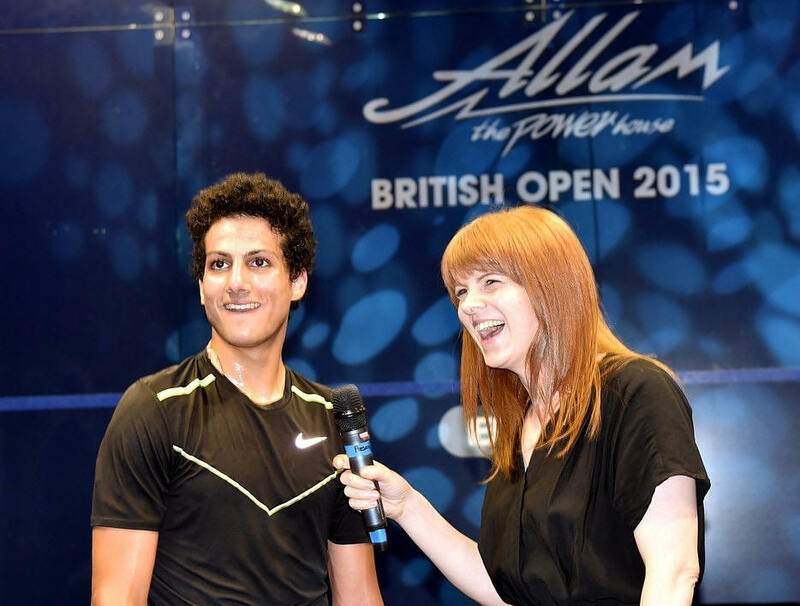 Basically, a great battle from Leftie Donnapova, who managed to beat Nour El Tayeb in 5 close games in her 7th match in 8 day (thanks Aisling for the info), as Donna won her final in Chorley on the Saturday, to start and try to qualify on the Sunday! 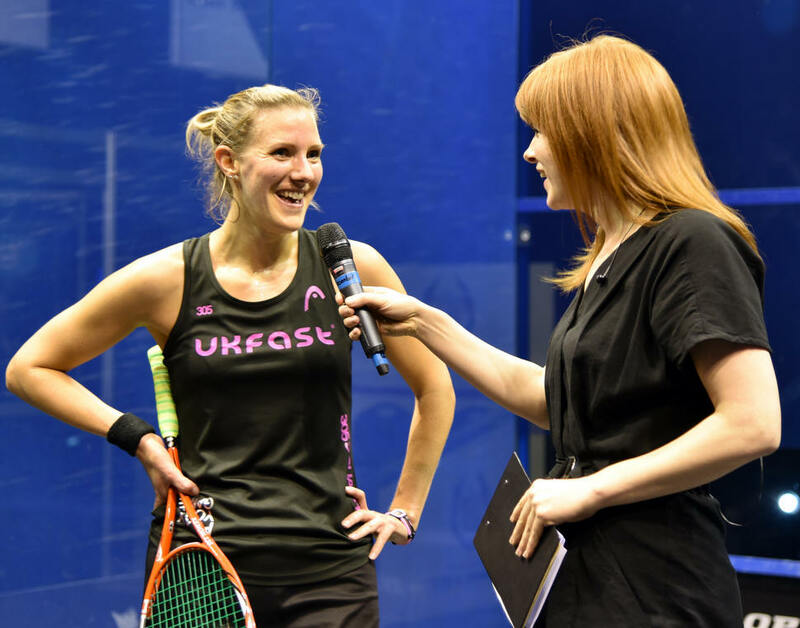 And even if she FINALLY got a day off yesterday – well deserved you will agree – she really really really had to dig in deep to compete today against the British National Champion Sarah Jane! Good effort from Donna in the first two games, but far too many errors. 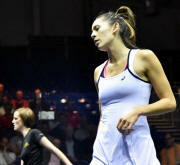 The Australia got a good start in the second, 5/2, she didn’t close out – tiredness at the end of the games? 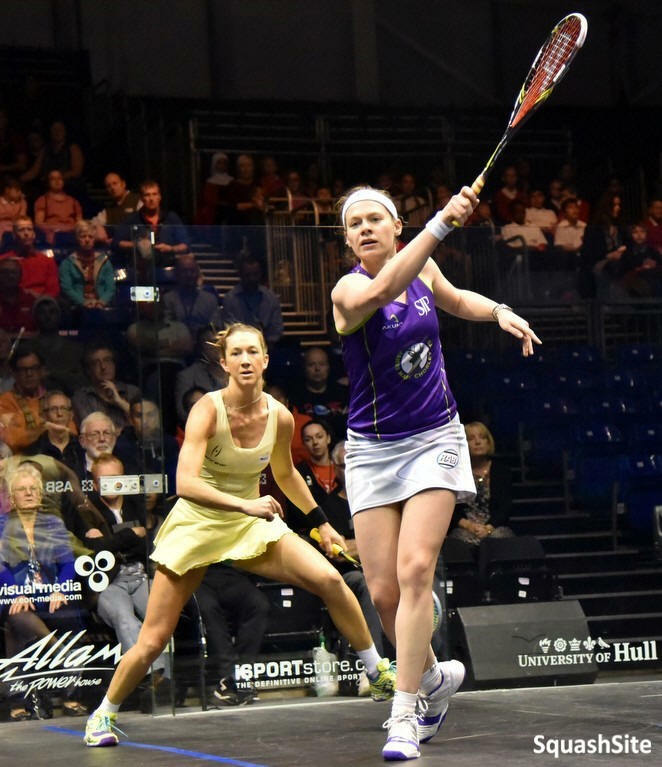 – and Sarah Jane, with her superb attacks and powerful hitting, scored 6 points from 6/7 , managing to get a promising 2/0 up. Did SJ relax a bit? Four unforced errors in 5 points for the English girl at the start of the 3rd, Donna again 5/2, but this time, she keeps her game together, 10/6, serves out – that tells you how tired she was, mentally and physically – but get one game back, 11/7. In the 4th, Donnapova will keep on fighting, but a huge COME ON from Sarah Jane at 7/5 after a great shot seems to pump the National Champ up, while Donna hits the Tiredness Wall, 11/6 in the 4th. To be noted: 5 decisions in the whole match. Nuff said. I played last Thursday, and you normally don’t get a chance to get your revenge that quickly! Funny, as I never played her before! 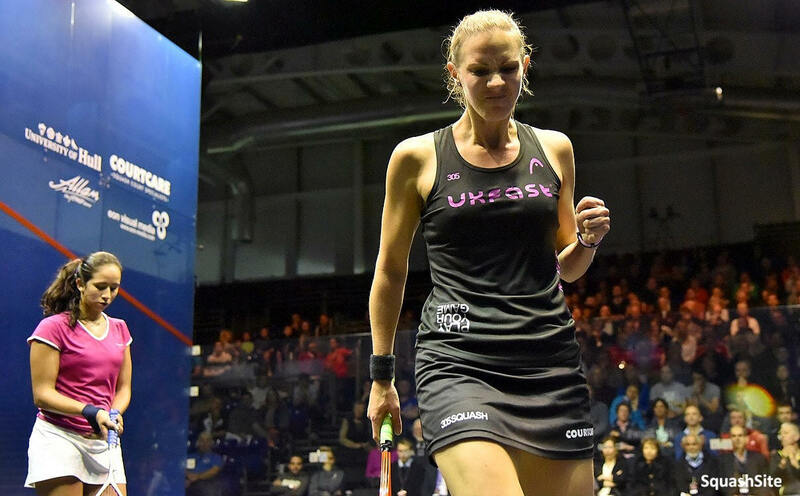 I lost two years ago in the second round of the British Open, I was up 2/0, and lost a close 3/2, so there was a lot of things going through my mind today, especially in the fourth game, she played really well, and made me fight for every point. 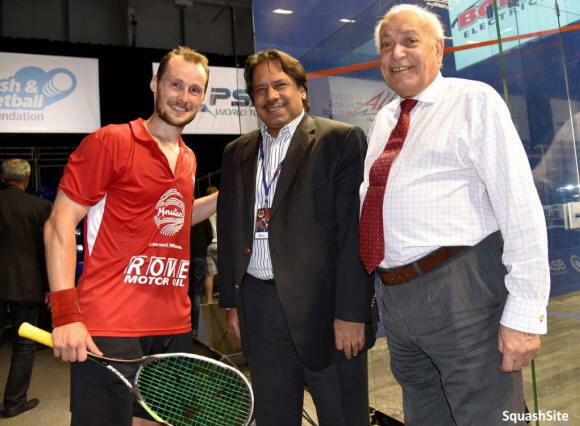 I had a good season that started with a quarters in Malaysia, I have a couple more now, last push, happy to have our physio to try and keep me together, doing a great job there, thanks for that . And again, like last year, I’m playing Nicol [probably] on my birthday tomorrow!!!! 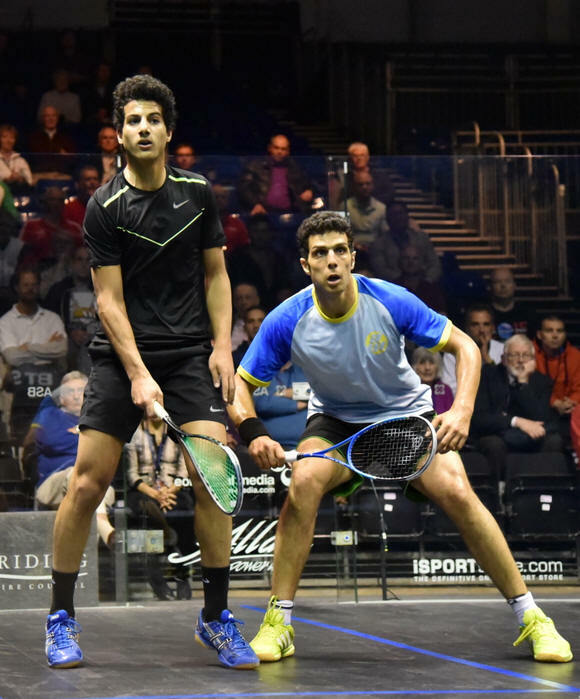 Mazen is one of the upcoming talents coming from Egypt, he has been my training partner for about a year now, I moved to his club, he is such a dedicated player, he has nice shots too! 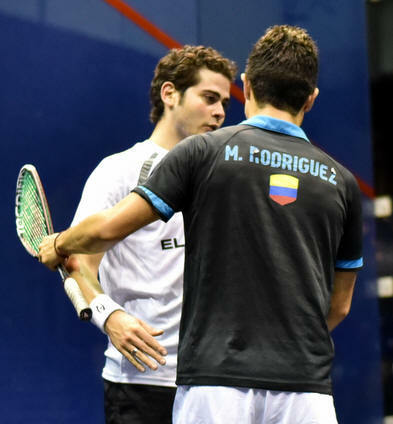 He can read my game pretty well, it’s never easy to play somebody with whom you train a lot with. He had an amazing performance today, and although I didn’t see his match against Coppinger, for him to beat him means that he must have been playing really well. And I expect him to really improve in the coming one, two years. It’s always good to not waste too much energy in a major like the British Open. Although today was really tough, it’s true that it’s not like playing a 122 minutes match! 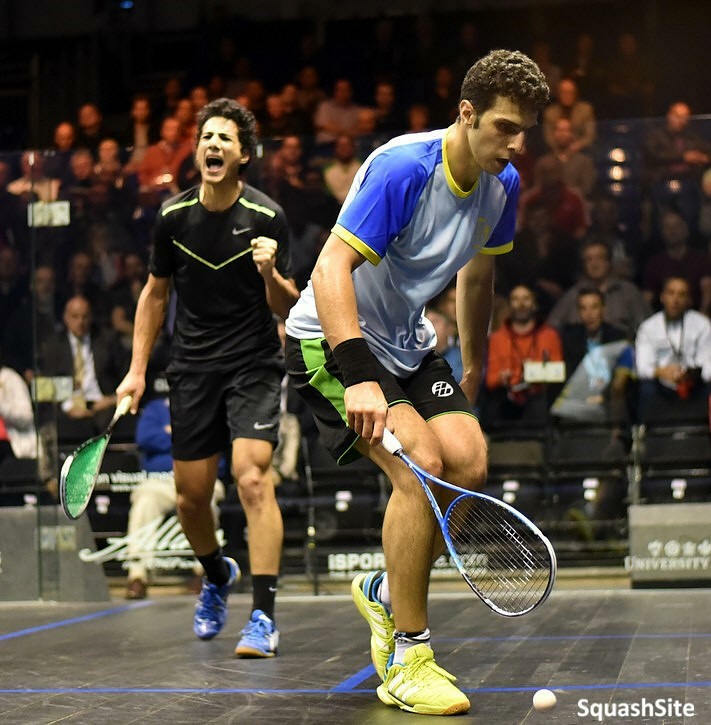 But I hope on the other hand that Gawad and Hesham will have a verrrrry long 5 setter of at least 3 hours…. 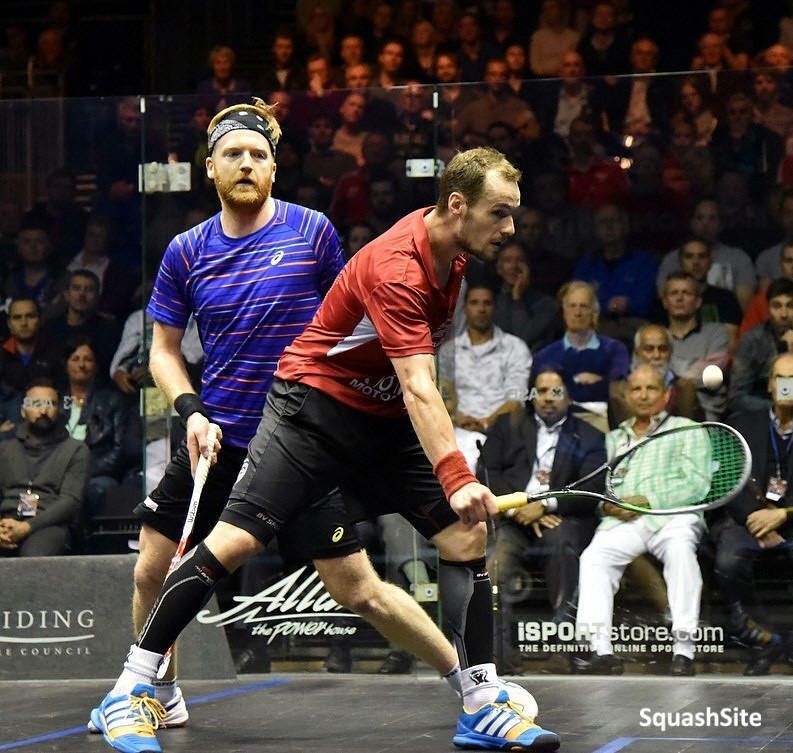 I've played in two quarter finals of the British Open but this time, I’m looking to get one step further. 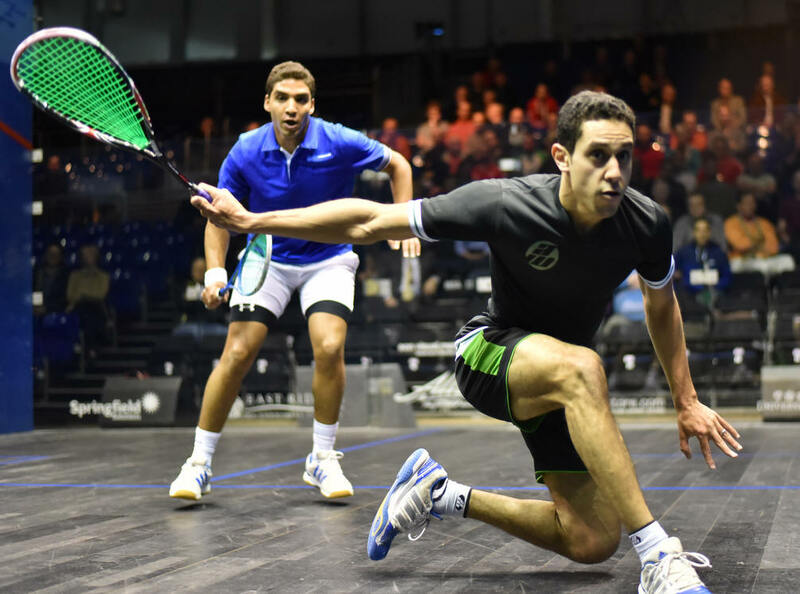 The young man from Alexandria – coached by Amr Mansi, El Gouna promoter – couldn’t really open the door wide today, but he sure put a foot to open it juuuuust a little bit. 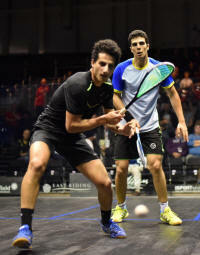 He “surprised” Tarek, if the word can be used between two players that play day in day out together, in the first game, very close between the two, taking it on his second game ball, 12/10 in 13m. 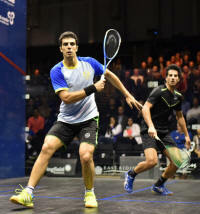 Second third,, Tarek was more focused and cut down the errors, Zahed just didn’t much say in those ones, still, 8m and 7m game, a few nice rallies. 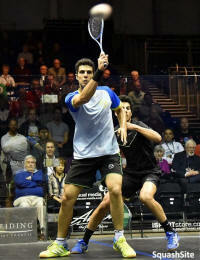 Fourth was as disputed at the first one up to 6/7, where Tarek just outplayed his opponent, finding some outrageous winners to close it nicely 11/6 on his second match ball, 46m. 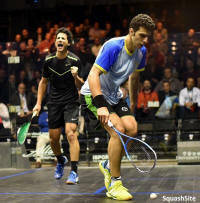 28 winners for Tarek overall, 16 for Zahed, and the same amount of errors – very low as far as Tarek is concerned, 8 each. After taking half a game to get used to the glass court after having played the previous round against Coppinger on a traditional court at the Uni, Mazen immediately showed Mosaad that he was not here to only clap the Hammer of Thor superb shots, and intended to make his mark. The Heliopolis man, coached by Omar Elborolossy here in this match, needed four game balls and 14m to finally take the opener 12/10, each player having a high number of UE, 6 each. 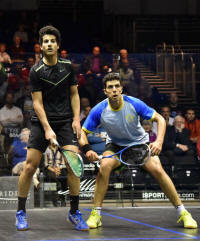 The second was completely blitzed by C&C Mazen, 11/5 in 8m, while the 3rd was about the same, only for Omar, 11/4 in even less time, 7m! Bless them. The fourth was nailbitting stuff, 2/2, 3/3, 4/4, 5/5, 6/6, 7/7, then some ridiculous/notinthebook/can’tteachthoseshots shots from Mazen, 11/7 for the contender, 14m again, with listen to that, 5 UE from Omar and 0 from Mazen. 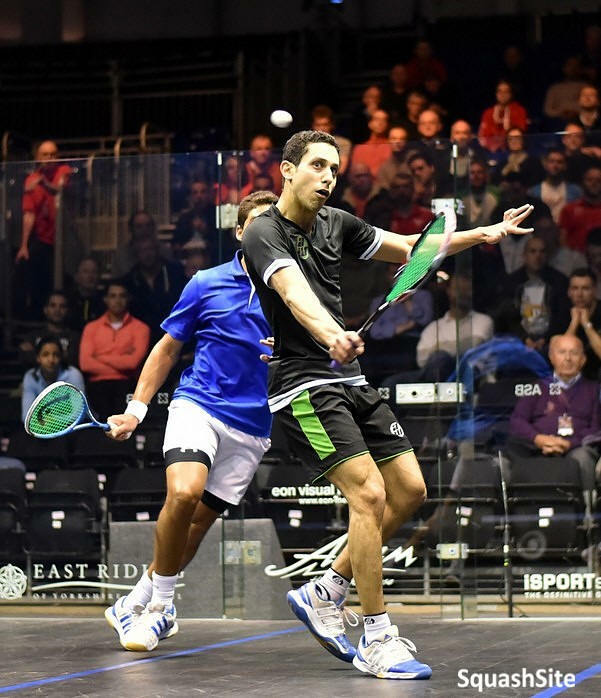 Fifth was basically dominated by Mazen, no pressure, letting the arm go, 3/0, 4/1, 7/3. And if Omar came back, found some power and winning shots to come back to 6/7, Mazen takes the match on his second match ball, 11/7. 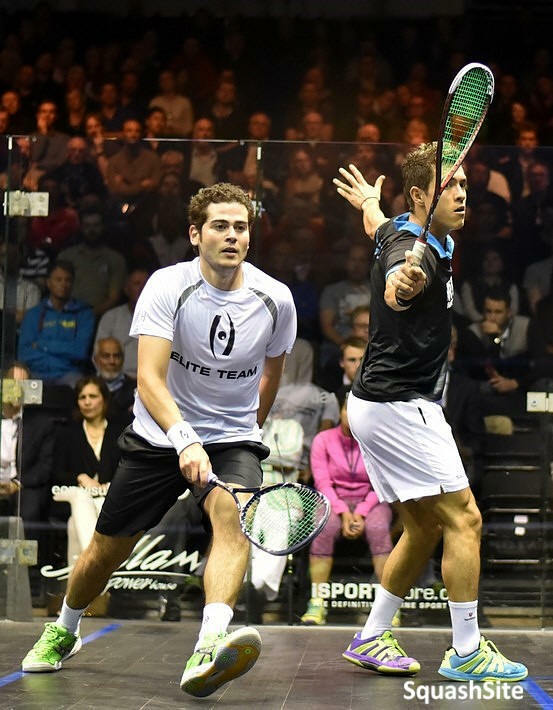 Superb battle, fair, very few calls, that’s the squash of the future people. 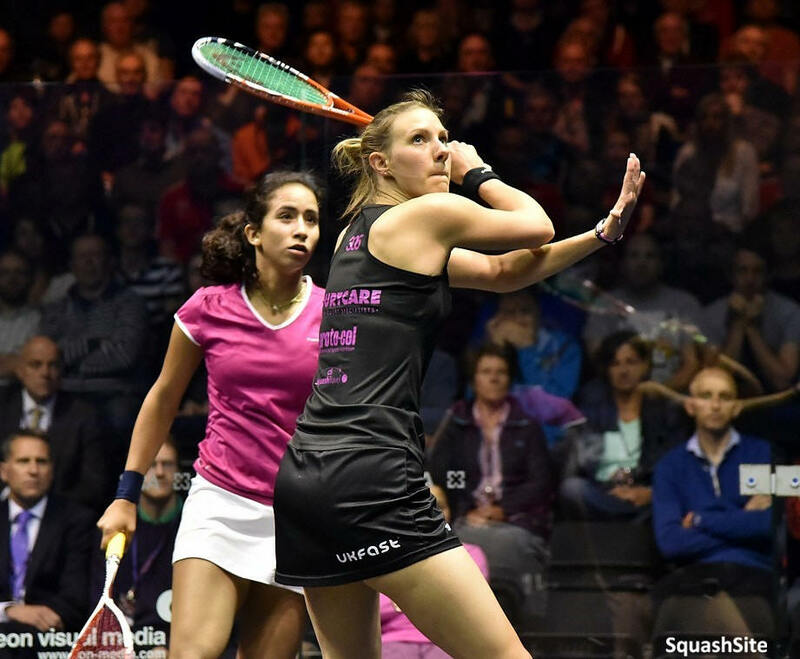 Soooo happy to reach my first ever quarter final in a major, and in this prestigious British Open, in front of so many people! Bad luck to Omar, he has always been one of my role models, like most of the upcoming juniors, he has taught us what sportsmanship is all about, he is a real example for us. Thank you so much guys, this is amazing, thank you, I’m soooooooo happy…. 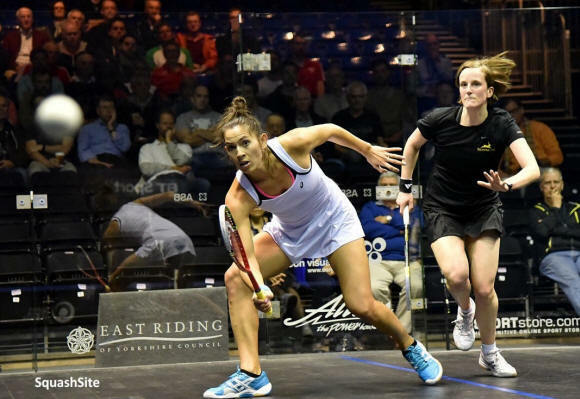 Laura had a bit of a nervous start against Nouran who you may not remember it, took out Nour El Sherbini, seed 4, during the latest Worlds in Cairo. Meaning, she has no fear or stress, and is not afraid of challenges! 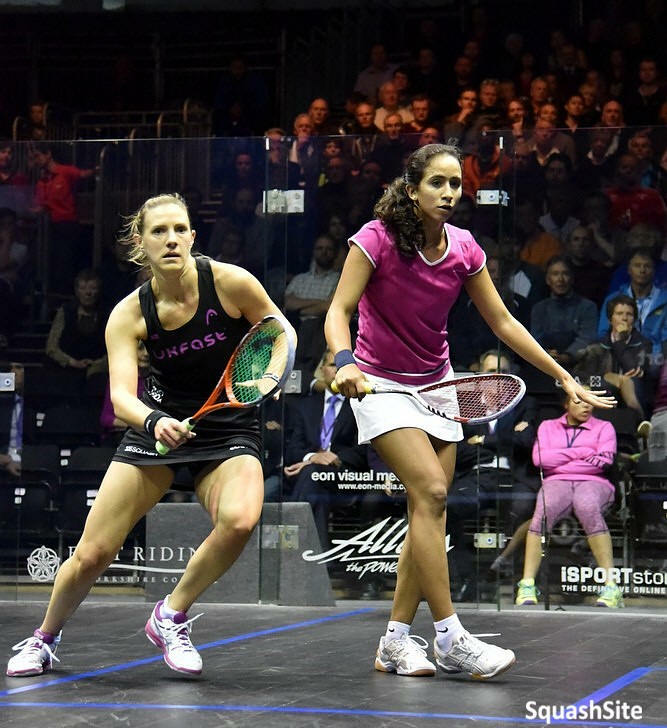 Nouran managed to stay in front of Laura, hitting the ball pretty hard, while Laura was not putting much pace on it. It all changed at the end, Laura coming back from 7/8 to take the game 11/9 on her third game ball in 10m. And the second was as close, nothing between the players, Laura managing to get the two last points from 9/9, a no let and a stroke, 11/9 in 14m. When we thought it was all over for the Egyptian junior – yes, only 17 bless him – she forced a few uncharacteristic errors from Laura, 11/8 Noura, in 11m. But Laura just came out firing with all guns in the fourth, 6/0, 11/1 in 4m to close it out nicely. She's a talent for the future for sure, there is a queue of them behind Raneem, who is not that old herself! Glad to get off there, experience and maturity made the difference there I think. I played the big points well, 8/8, 9/9, I normally do well there and manage to get through, it’s a strength of mine. When I won the BO in 2013, first home winner for 22 years, in front of my homecrowd, I didn’t know every person in the crowd, but it felt like I did. And again last year, it was very close and it nearly got me over the finishing line, so please, keep supporting us, you have no idea how much we appreciate it, we have to put up with it all around the year for Raneem or Nicol, so please, keep supporting us. Plus, tomorrow, I’m playing a kiwi!!! 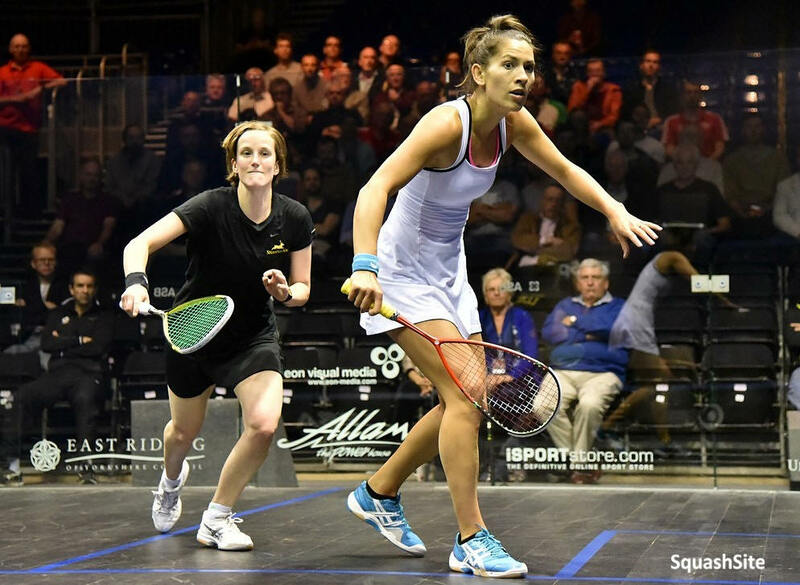 Second, this time no big gap, close all the way, and this time, Emma finds the solutions from 9/9, in 13m, 11/9. Fourth like I said, all close up to 4/4, and a big energy drop – not exactly surprising with the amount of miles and court visitation Emma did today – 8/4 and 11/5, match Nic in 8m, 53 overall. Funny to note that Nicol made a lot of unforced errors today, 13, only 7 for Emma…. Really good performance from Emma, especially in front of her home crowd spurring her on, I knew it was going to be a tough one, and it was. I managed to play really well in the end, and got my game together. It’s so nice to have my team here with me, Liz my coach, Frank my mental coach and Maurice my physio, I can go out there knowing I have got my support right behind me. He is a very dangerous player, he beat me in a tough match in Chicago 3/2, today I have my revenge. He is not 100%, but I took my chances, I didn’t want to give him a game. It was a long season for all the players, playing every month, I’m just going to have a last big push, it’s my second quarter final of a World Series. 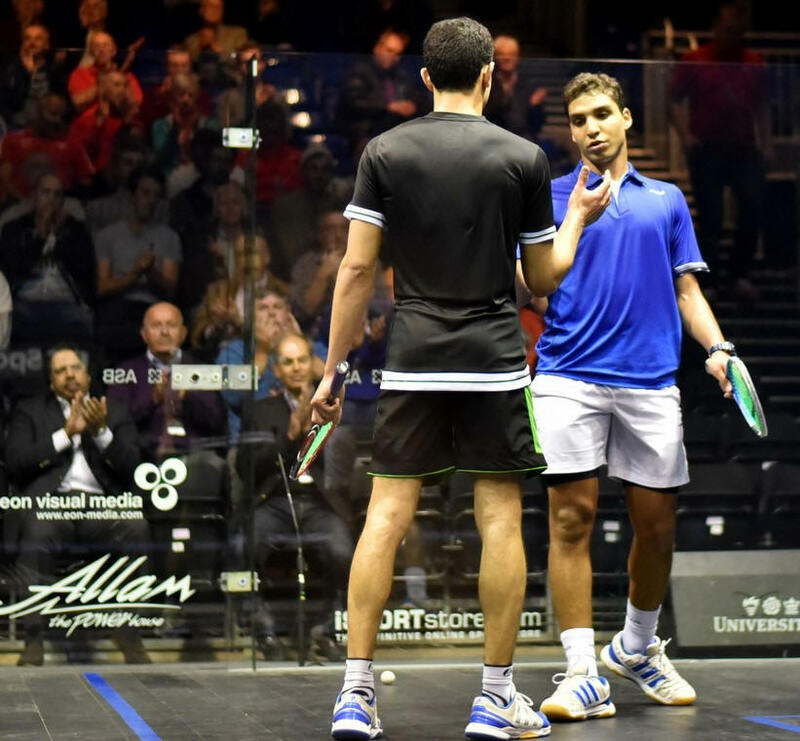 I’m playing Tarek next, we know each other’s game pretty well, we both have some good speed on the court, it will be a good battle. Karim arrived here with not much squash in the leg as he had to let his left hip rest a bit. 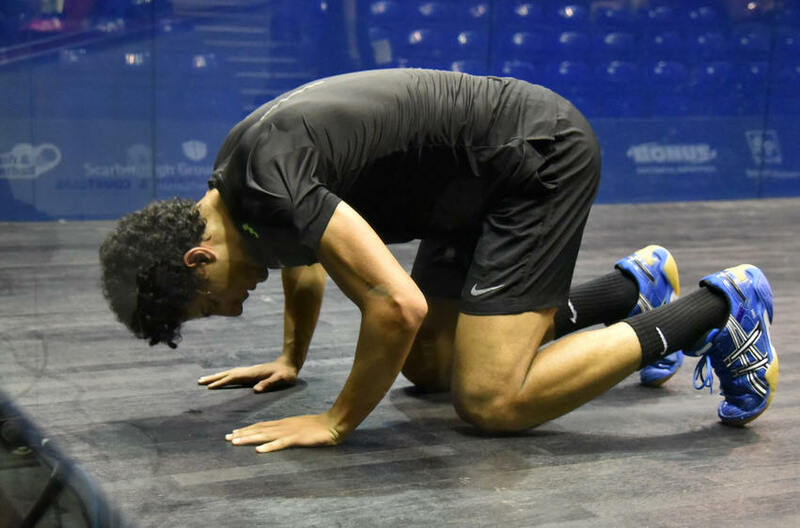 He managed to beat Cameron Pilley in a huge battle of over 80 two days ago at the Uni, and during the match, also fell heavily on the painful hip. While it was warm, I guess it was alright, my guess is that the pain will have flared up when cooling down, and that even Hossan’s magic, the Egyptian physio, couldn’t sort him completely. 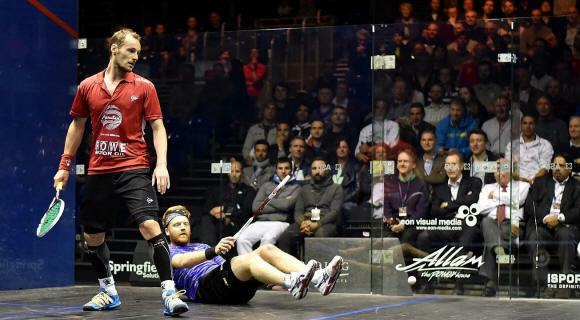 All credit to him, he finished the match, and Miguel just kept pushing and twisting the knife in the wound, playing a superb attacking and relentless squash. 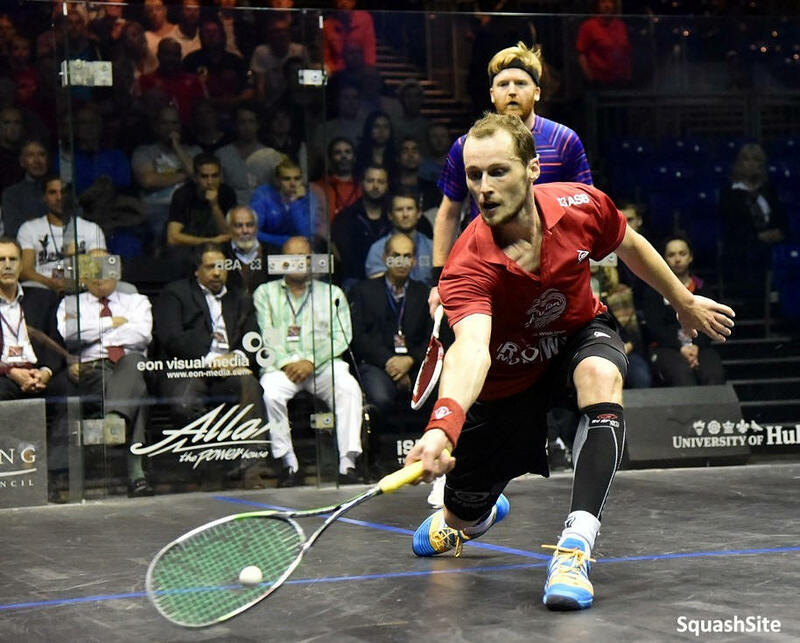 Tom said in his post match interview after his victory on “One Legged Daryl” as Tom called him, that Greg was the player he enjoyed the least playing, as the low and hard hitting from the Frenchman impaired and prevented him from volleying and playing the game he liked. And that’s exactly what happened in the first two games, time for Tom to adapt to both conditions and Greg’s tremendous pace and movement. 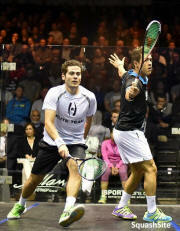 But as Tom mentioned, he manages to finally play a bit better against Greg if he plays him often. Well, we could see a definite improvement in the third, the score says it as well, 11/7 instead of the 11/3, 11/1 in the first two games. Those scores that looks pretty one sided were not that accurate, as the rallies were long and Tom made Greg work of his points, 12m first game, 10m second! I was talking with Tom a bit before the match, and he was telling me that he didn’t have enough tournaments because of injury and I guess for him arriving on the second round of a major is a bonus for him. 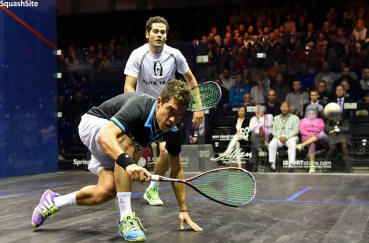 Also, he had to qualify, and he is maybe a bit flat, this is in fourth match. 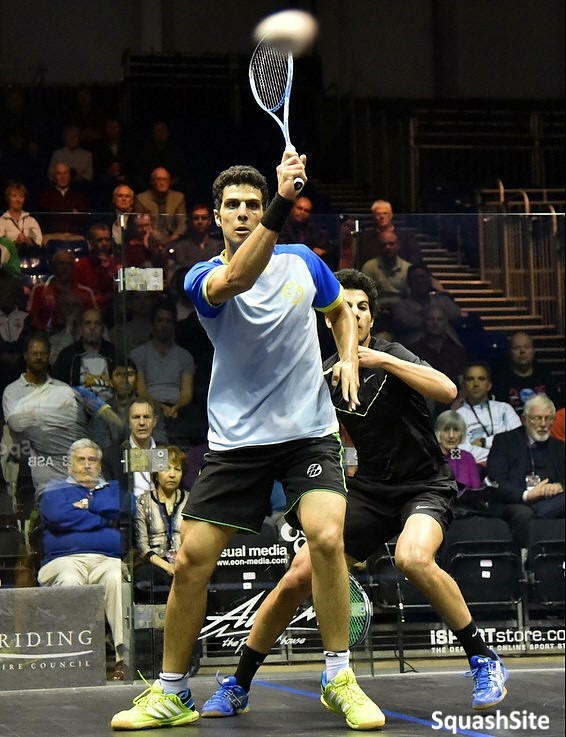 Plus, he played three matches on the traditional court, this was my second on the glass, I have my marks, and that was an advantage for me. I did the job today, he did what he could, I did what I could, and hopefully people have enjoyed it. I’m playing Hesham next, who created an upset by beating Mosaad, a top 8 player. This was not the match I expected, , it’s a new player, I never played him, so I’ll do some analysing tonight and tomorrow, and for sure it will be fast and furious.